Using scissors carefully cut around each stencil individually. Draw around each stencil one at a time on your desired color felt for each part of the turkey. Cut around the outline so all parts of the turkey are loose. You will need to print two or three of each of the leaves, choose different colors to create impact. Using the image to help you, on the turkey’s body place on the beak, eyes and wattle. When you are happy with the placing, use the glue to secure these down. Flip the body of the turkey over so that the eyes, peak and wattle are face down. Glue down the straight edge of the feet and place this at the bottom of the body. After this, glue down the wings of the turkey at each side of the body. Flip back the turkey’s body so you can see the face again. You should be able to see the feet and wings from this way up. 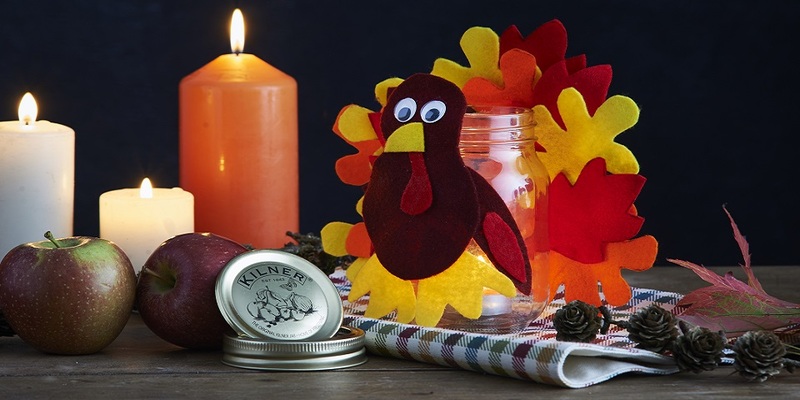 Glue the whole body of the Turkey onto one of the sides of the 17 fl oz Kilner Canning Jar. For the other side of the jar, spread out the leaves/feathers of the turkey on the piece of card. Make sure the stem of each leaf is within the card and covers all of the square shape. When you are happy glue them all down onto the card. Glue the back of the card with the leaves on the side which is empty. Attach this to the jar on the opposite side to the turkey’s body. Finally, place a small battery operated tea light candle inside at the bottom of the jar and turn on. You can also use your Kilner® Turkey Jar for storing sweets, simply remove the tea light and use the lid provided to keep the content fresh!